"One of the area's freshest acoustic acts!" 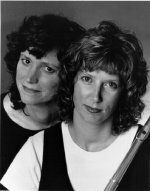 Lynn Hollyfield and Nina Spruill are known for their intricate blend of harmonies accompanied by guitars, flute and mandolin. "A duo to be watched ... their live performances are especially engaging; characterized by everything from the very moving to the very amusing. The performances highlight a distinctive repertoire ranging from contemporary originals to traditional blues/folk arrangements. Recently, Hollyfield & Spruill have been performing with the percussionist, Norm Thome. In December 1992, Hollyfield and Spruill released their first recording - Slipping Time. Available on CD and cassette, this recording received high praise from the Washington Post. The recording features many originals and some outstanding guest performances by Al Petteway and Mike Auldridge among others. Slipping Time's "weave of musings and music ... casts an introspective spell, but not to the exclusion of more earthy and engaging material." It "gracefully taps into blues and swing grooves...strong and affecting ... crisp guitar work... instrumental charm ... lures you away." The cut So It Goes won third prize in the Mid-Atlantic Songwriters Contest. In 1993, Hollyfield & Spruill received five WAMMIE (Washington Area Music Awards) nominations and one WAMMIE nomination in 1996 for Best Acoustic Duo for their work. Hollyfield & Spruill have recently finished their second recording - Blue & Green, which is now available on CD and cassette. Blue & Green was recorded in Fairfax, VA at Recording Arts. It is comprised of mostly original material and features some guest artists including Tom Prasada-Rao, Tamer Eid and Rick Schmidt. Blue & Green has been receiving airplay locally on WETA, 90.9 as well as on national folk programming. The cut, Warm Summer Rain, has been chosen for the OASIS CD sampler. Watching the Sky and Cold as Stone, respectively, placed as third and fifth finalist in the Folk category of the Mid-Atlantic Songwriting Contest. Currently, the duo is co-producing the summer series "Concerts in the Woods" at the Ferguson Foundation Amphitheater in Accokeek, Maryland.